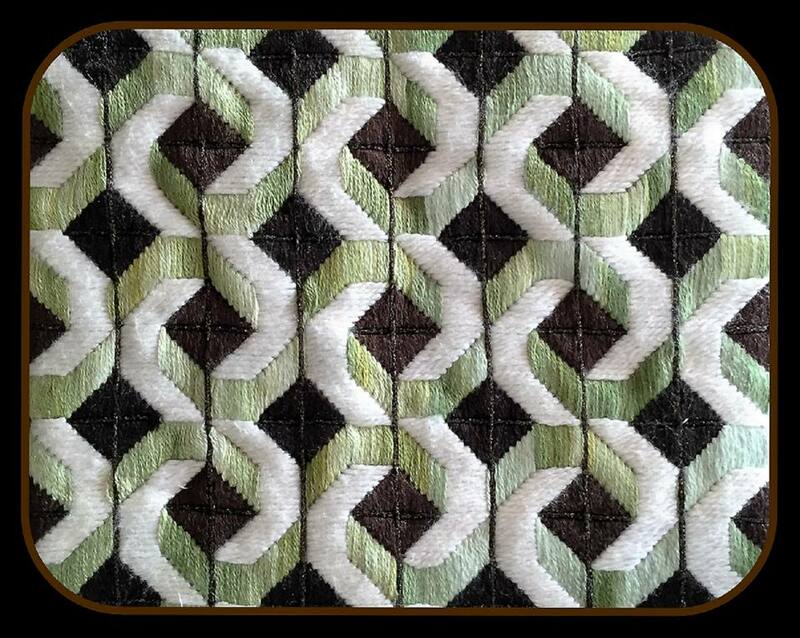 Here’s a quick and easy Bargello needlepoint design to work in spare moments. A great project for on the go, it is a refreshing change of pace for those “in-between” times when you’re tired of working on a larger, more intense and complicated needlepoint project. Adapted from a beautifully patterned dress fabric, the simple swirl needlepoint design is worked entirely in long and straight stitches over different numbers of canvas meshes. It can be finished quickly, in as little as a weekend or as long as 4 or 5 days—depending on your stitching speed and how quickly you get the hang of the repetitive Bargello pattern. Beginner needlepointers will enjoy making this for a first Bargello project and displaying the finished piece with pride. It’s also one of the best ways for skilled needleworkers to take a break and work a small and quick Bargello embroidery project on needlepoint canvas. Needlepoint canvas in desired size plus 3 inches more around all sides. 2 Pairs of Stretcher Bars to fit the needlepoint canvas. Masking Tape and Brass Thumb Tacks to prepare the canvas for stitching. Threads in brown (metallic braid as well as a wool-silk blend), variegated or overdyed green (stranded cotton) and cream (wool-silk blend)—enough to complete the project. Usual stitching supplies including embroidery scissors, ruler, and a waterproof marking pen. Project bag to organize supplies and to keep the needlepoint project neat and clean. Download both free needlepoint charts. Chart A shows the full design with repetitive swirls so that you can see how to position them on the canvas. Chart B is a detailed stitch guide to show you how to work the Bargello pattern. Print both charts in a large enough size so that you can easily see the canvas mesh for proper counting and placement. Cut the needlepoint canvas to the desired size. Bind the edges with masking tape to protect the mesh and stitching threads from rubbing against any rough frame or stretcher bar surfaces. Draw an outline that is 3 inches from the edge on all sides of the canvas. With this design, it is important to draw an accurate outline for use as a stitching boundary. The blank canvas outside of this boundary will be utilized in blocking and finishing. Mark the center of the canvas. Using a ruler, find both the horizontal and vertical centers within the stitching boundary and draw intersecting lines. Select threads and fibers. Use the colors in the photo as a guide or choose different ones to suit your personal taste. Experiment with these colors on scrap canvas. If they don’t look right to you, change them until you are satisfied with the result. The swirl needlepoint project was worked with a combination of wool-silk blend single-ply thread in cream and brown, as well as green variegated/overdyed stranded cotton. Brown metallic braid was used for surface embroidery couching after the regular stitching was completed. Most Bargello needlepoint designs are line drawings on a graph instead of colored squares. You will use the color photo of the completed needlepoint, as well as Charts A and B when stitching this project. So keep them handy and refer to them continually as you stitch. Notice that these stitches share canvas holes, so you may find it difficult to come up through an empty hole and go down in a shared one. Just stitch in a manner that gives you proper coverage on the back of the canvas. Because of this needlepoint design’s long straight stitches that cover from 2 to 8 meshes with the Center Motif stitches covering as many as 16 meshes, you will want to make sure that you have adequate coverage on the back of the work as well as the front. As you work each stitch, it will seem as if you are using up a lot of thread; but this is needed to support the extra-long stitches on the back of the work. Look at Chart B and start in the center of the needlepoint canvas to work the Center Motif of the Bargello Swirl Design. You can either center the motif itself by working the largest stitch over 16 meshes and then work the stitches on either side to form the small diamond. Or you can work it as follows: a) come up at (1) and go down at (2); b) come up at (3) and go down at (4); c) Continue by coming up at (5) and going down at (6) and working your way across the motif as shown. Work the bottom section Green Bargello Swirl Stitches shown in the center of Chart B. Starting on the left side of the Center Motif, make the first stitch from (1) to (2), “stepping down” one mesh for nine stitches moving toward the right of the canvas. Then work eight stitches straight across and begin an upward “step” for eight more stitches as shown on the chart. Work the top section Green Bargello Swirl Vertical Stitches beginning at the right side of the Center Motif from (1) to (2), stepping up one stitch as in the bottom section and so forth until you have completed the pattern. Make the Cream Bargello Swirl Horizontal Stitches by starting at the top left of the Center Motif and working counter-clockwise, filling in around the green and brown stitches. Next, start at the bottom of the brown motif and fill in the straight stitches moving clockwise around the design until you reach the top. By now, you should have gotten the hang of working straight Bargello stitches; so the horizontal ones are not numbered. In needlepoint, there is a general rule of thumb that you should start every project with the result in mind. If you can not make up your mind about what to do with the completed needlepoint; just stitch it for the pure enjoyment of working on something different in the spare moments between two large needlepoint challenges. Whatever you decide to do with the finished item, you’ll need just a tiny bit of blocking. Simply re-stretch the canvas on the same stretcher bars and lightly steam the completed needlework. A few suggestions for the finished Bargello include sachet pillow, table mat, small purse, hot pad/trivet and tray insert. Depending on how large you make the design, you could even turn it into a throw pillow. The important thing to remember here is to have loads of fun stitching and getting used to making quick and easy straight-stitch Bargello needlepoint projects! Make This Straight-Stitch Needlepoint Necklace in One Hour or Less!